As the climate changes, dams face new challenges for water rights and releases. 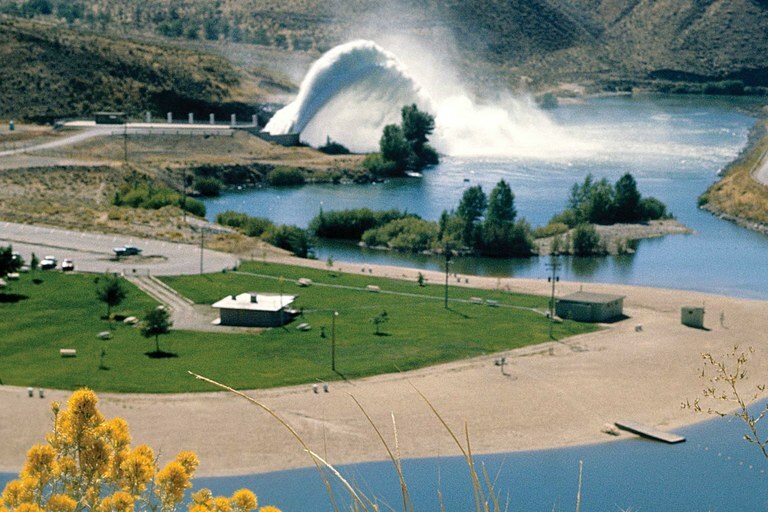 On a sunny day in late April, the U.S. Army Corps of Engineers released hundreds of millions of gallons of water from Idaho’s Lucky Peak Dam, a dozen miles upstream of Boise. The dam operators call it a “rooster tail” display; thousands of observers took in the spectacle. The water, roaring out of a dam gate, arced high above the Boise River, rainbows shimmering in its spray. Rooster tails are one way the Corps releases excess water to reduce the risk of flooding — a partially empty reservoir can capture spring runoff before it can race downstream and inundate Boise. Releases are necessary about seven years out of every 10, including this year, when basin flows were among the highest recorded. Lucky Peak and two associated reservoirs also store water for irrigation. In snow-heavy years, that means dam operators must strike a balance between letting enough water go early in the spring and retaining sufficient water for the hot, dry days to come. Getting releases right is crucial for the farmers who depend on the Boise River to irrigate crops like sugar beets and seed corn. The river also waters lawns and parks, and supplies about 30 percent of Boise’s drinking water. As in other Western states, water users with older rights get first dibs. But since 2013, several irrigation companies and the Idaho Department of Water Resources have been fighting over administrative details that determine which water Lucky Peak irrigators are entitled to use during a wet year: flood-control releases, or the “refill” water that collects after releases are done. The case is now before the Idaho Supreme Court. Its outcome will determine how the water in the Boise River system is doled out — no small consequence for the people and fish that depend on it. The fight itself, however, highlights a larger challenge water managers across the West are confronting: How do you operate dams effectively as climate change alters the historical patterns used to predict runoff timing and volume? Water being released from Lucky Peak Dam creates a rooster tail flowing into the Boise River. The Department of Water Resources contends that water counts toward storage rights upon entering the reservoir. That means flood-control releases could include already-allotted water. But irrigators say those releases arrive too early in the season to be useful, sometimes while snow still covers their fields. They claim they are entitled to the water that subsequently refills the reservoir, which is distributed later in the summer when they need it most. While the department does dole out refill water, it considers it to be excess and unappropriated water that doesn’t fulfill any reservoir storage rights. In September 2016, District Court Judge Eric Wildman ruled partially in favor of the department, writing that water entering the reservoir satisfies users’ rights. However, he also pronounced the department’s practice of allocating refill unlawful, leaving the refill water distribution in limbo. The Supreme Court is expected to make a decision by year’s end. “For anybody to say that (releases) should be counted against our storage rights, as water that we’re actually using — it’s ridiculous,” says Roger Batt, executive director of the Treasure Valley Water Users Association, the irrigation companies’ lobbying group. Regardless of its legality, the department’s method has largely kept water flowing to the irrigators. Since its implementation in 1986, there’s only been a single year in which there were flood-control releases but users didn’t get their full amount. But the problem isn’t purely theoretical, says Mathew Weaver, Idaho Department of Water Resources deputy director. With no rights attached to the refill, future demands could take water that current users have come to rely upon. Extremely wet years could, paradoxically, leave fields and lawns parched if big flood-control releases happen and the refill water has been claimed for other uses. A similar case occurred in Idaho’s Upper Snake River Basin, where large diversions for groundwater recharge spurred a 2015 settlement in which irrigators gained legal rights to refill water. Those rights, however, date to 2014, meaning they have lower priority than older water rights. Adding to the complexity of the situation, refilling reservoirs may be getting more difficult, thanks in part to shifting precipitation patterns caused by climate change. Greater extremes — wetter wet years and drier dry years — and earlier spring thaws could make it harder to manage dams, says Doug Kenney, the director of the Western Water Policy Program at the University of Colorado. “All these operating guidelines that you built up based on data from the last century just don’t work very well anymore,” he says.